Hearing Loss is common amongst individuals with Noonan Syndrome (NS), affecting up to 50% of people with NS. There can by many causes of hearing loss in NS; all of which we will explore in this Blog. But to better understand hearing loss it is best to first understand the physiology of hearing. Hearing is the process by which the ear transforms sound vibrations into nerve impulses which are then sent to the brain where they are interpreted as sounds. Sounds are produced when objects produce pressure pulses of vibrating air molecules – called sound waves. These Sound waves enter the external ear. 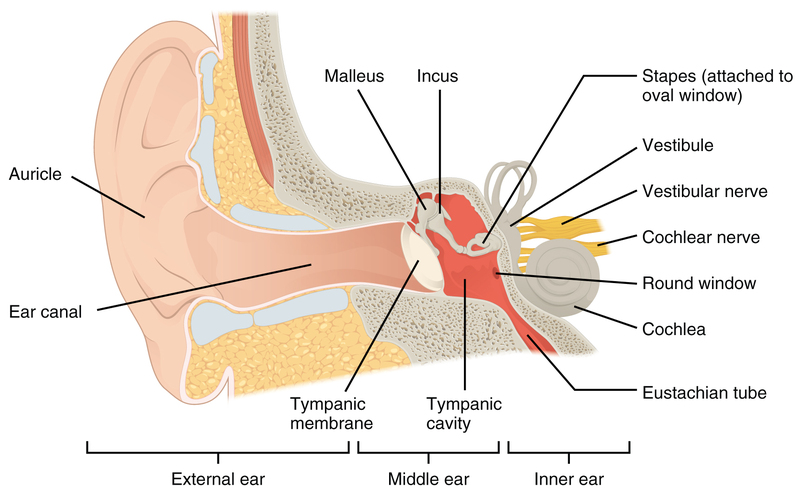 After crossing the external auditory meatus, the wave reaches the tympanic membrane. When these sound waves reach the tympanic membrane they cause it to vibrate. Low frequency sound wave causes slow vibration while high frequency wave causes rapid vibration. 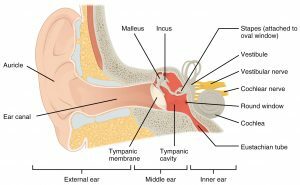 The vibration of tympanic membrane moves the malleus in middle ear. The vibrating malleus produce vibration to the incus and the vibrating incus moves the stapes in and out of the oval window causing vibration of the perilymph in the scala vestibuli. 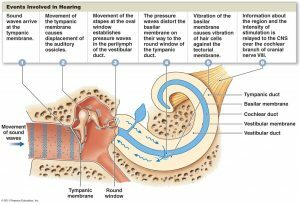 Vibration of perilymph are transmitted across the vestibular membrane to endolymph in the scala media (cochlear duct) and also up the scala vestibuli and down the scala tympani. The vibration of scala tympani are dissipated out of the cochlea through the round window into the Eustachian tube. During the transmission of vibration from perilymph to endolymph in scala media, the basilar membrane ripples. This ripple is concerned with the frequency and intensity of sound. This vibration causes bending of the receptor hair cells of the organ of corti to generate potential. This potential excites the cochlear nerves to generate action potential (impulse). The nerve impulses from the cochlear nerve are conveyed to the auditory area of the CNS via common vestibule-cochlear nerve. 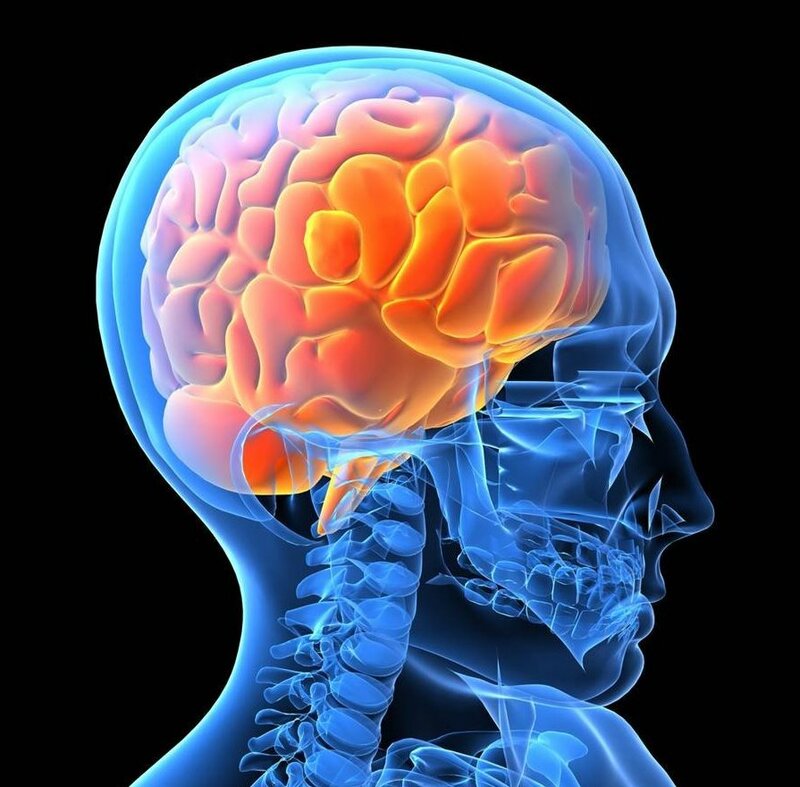 The auditory area is located in temporal lobe where sound is perceived by the brain. Hearing Loss due to Otitis Media (Glue Ear) occurs in 15-40% of people with NS. Otitis media refers to inflammation of the middle ear. When an infection occurs, the condition is called “acute otitis media.” Acute otitis media occurs when a cold, allergy, or upper respiratory infection, and the presence of bacteria or viruses lead to the accumulation of pus and mucus behind the eardrum, blocking the Eustachian tube. This causes earache and swelling. All people with middle ear infections or fluid have some degree of hearing loss. This is potentially significantly consequential in young childhood. Essentially, a child experiencing hearing loss from middle ear infections will hear muffled sounds and misunderstand speech. This can lead to the child losing the ability to consistently understand speech in a noisy environment (such as a classroom) leading to a delay in learning, speech and language skills. This is why any child who has had repetitive ear infections (more than 3 in a 12 months) should have a hearing assessment as soon as possible. Treating Otitis Media typically involves using anti-biotics to kill the bacteria responsible for the infection. Other necessary medications/solutions may include antihistamine/decongestants, intranasal and/or systemic steroids, nonsteroidal anti-inflammatory drugs (NSAIDs), mucolytics or aggressive management of allergic symptoms. When these efforts fail to resolve Otitis Media surgical interventions may be necessary. A Tympanocentesis may be performed which involves piercing the ear drum to allow the trapped swelling to vacate the ear canal. Tympanostomy Tubes (or ‘Grommets’) can be inserted to prevent fluid accumulating in the middle ear. Grommets can also allow anti-biotic drops to be inserted directly into the ear bypassing the need for oral anti-biotics which can cause gastric discomfort. Grommets by preventing fluid accumulation and subsequent infections can help improve speech, balance and hearing in children with chronic Otitis Media. Lastly an Adendectomy (removal of the adenoids) may be recommended as this helps improve Eustachian Tube function; particularly in children older than 3 years of age with chronic Otitis Media. Thankfully permanent conductive hearing loss only affects 3% of people with NS. Most cases of non-permanent conductive hearing loss are from otitis media as described above. Permanent conductive hearing loss means there is a structural deficit involving either the tympanic membrane, auditory ossicles or both. Permanent hearing loss may also result from chronically untreated Otitis Media. Conductive hearing loss can be ameliorated with the use of conventional or implantable hearing devices. An Otolaryngologist can determine the specific cause of the hearing loss, advise patients of their treatment and rehabilitative options, and help patients achieve the best possible hearing outcome and hearing related quality of life. Various studies show that high frequency hearing impairment effects 25-50% of people with NS and low frequency impairment effects 10%. Hearing aids can help people with mild to moderate sensorineural hearing loss. If the sensorineural hearing loss is severe simply amplifying the sounds with a hearing aid won’t provide the individual with adequate hearing. In these cases Cochlear implants may be necessary. These are surgically implanted devices that bypass the damaged/dysfunctional parts of the inner ear and transmit sounds directly to the auditory nerve. Any decision regarding Cochlear implants should be part of an overall therapy program with a qualified health professional to help the patient analyse and interpret information coming from the device. Mixed hearing loss only affects 3% of people with NS and as the name suggests it involves a combination of conductive and sensorineural hearing loss. This type of hearing loss makes sounds both softer in volume and harder to understand. A bone conduction implant is an effective treatment for mixed hearing loss as it bypasses the conductive element and needs only to address the sensorineural element. A Bone Conduction Hearing Device typically consists of two parts: 1) an external implant sound processor that detects and turns the sound the sound into vibrations; and 2) a surgically-implanted fixture that is inserted into the skull behind the ear. Any decision to have Bone Conduction Hearing Devices should be part of an overall therapy program with a qualified hearing health professional, such as an audiologist that will help the patient’s brain make sense of the new information being sent by the device. External ear anomalies are common in NS – so common in fact that they are some of the defining clinical diagnosis criteria. 90% of people with NS have low set ears; meaning they sit lower on the side of the face than non-NS individuals. 37% have posteriorly rotated ears; meaning they tilt backwards. 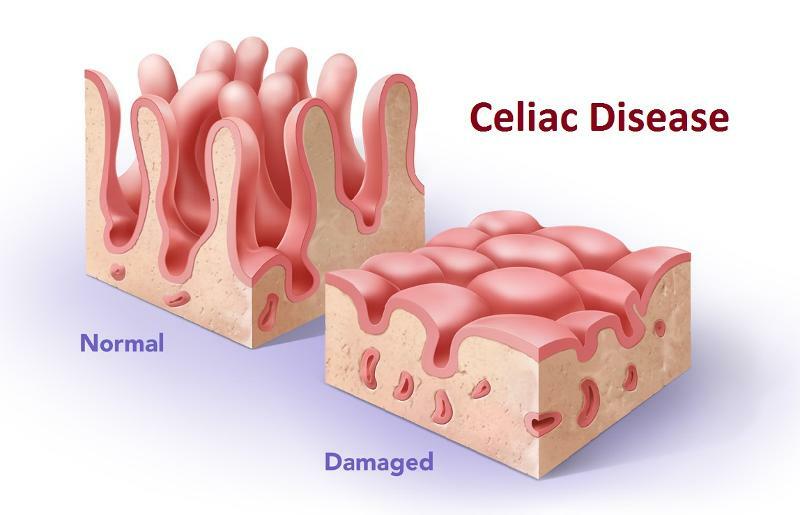 24% have thickened helices which is the outer part of the ear. None of these external ear anomalies interfere with the physiology of hearing and are not a factor in hearing loss. Knowing that your or your child with NS has a much higher risk of hearing loss can be worrying for parents and carers. Hearing loss can have a significant impact on speech and language skills and it is for this reason that a hearing assessment is recommended for all children with NS before the end of their first year (see our Clinical Management Guidelines here). Unfortunately the average age of diagnosis for NS is 8 years of age. In this case and any case of diagnosis after the first year a hearing assessment should be scheduled as soon as possible. As worrying and impactful as hearing loss may be, remember there are many successful treatment strategies available to help you and your NS child as we have discussed in this Blog. If you have any questions or if we can help in anyway please don’t hesitate to contact us here. Van Trier, DC. et.al. (2015). External Ear Anomalies and Hearing Impairment in Noonan Syndrome. International Journal of Pediatric Otorhinolayrngology, Vol. 79 (6): 874-878. Qui, W.W., Yin, S.S & Stucker, F.J. (1998). 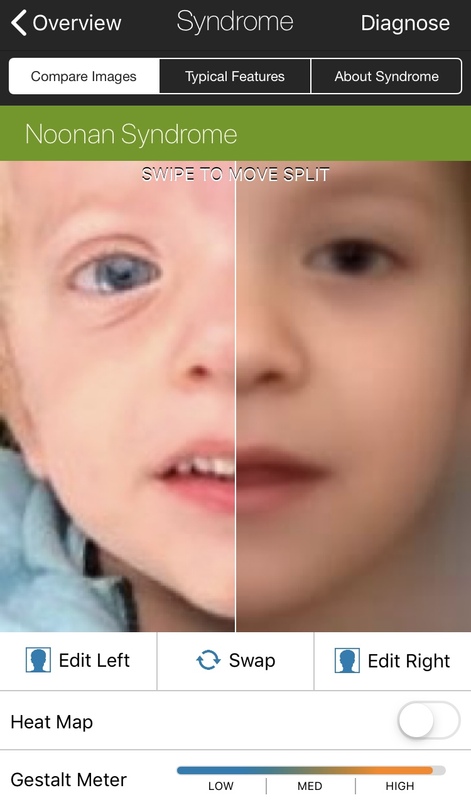 Audiologic Manifestations of Noonan Syndrome. Otorhinolaryngological Head & Neck Surgery, Vol. 118 (3) 319-323.